ZAPPWARE shows record financial growth figures for fiscal year 2017-2018. HASSELT, Belgium – 9 October 2018. With 17 years of experience in the industry, Zappware has always been able to surf on the right technology waves and harvest profitable growth in its home market and across the world. Last fiscal year was a record growth year. Patrick Vos explains: “Since the launch of the new NeXX 4.0 solution-suite 2 years ago we’ve got good traction from the market, including from Tier1 operators, with now commercial launches in several regions. We reach end-user customer satisfaction rates of over 90%. That is an interesting metric because we always have had the end-user in mind while designing our solutions. These commercial successes are also reflected in the financial results: we clocked a record revenue growth of 56% and more than tripled our bottom-line result last fiscal year. We’re on the right track along our international growth journey. While further developing our presence in different regions, we also evolved from a project-house to a product-house. This guarantees a robust and cost-efficient model for our customers and for us. That approach is now visible in our latest financial figures”. 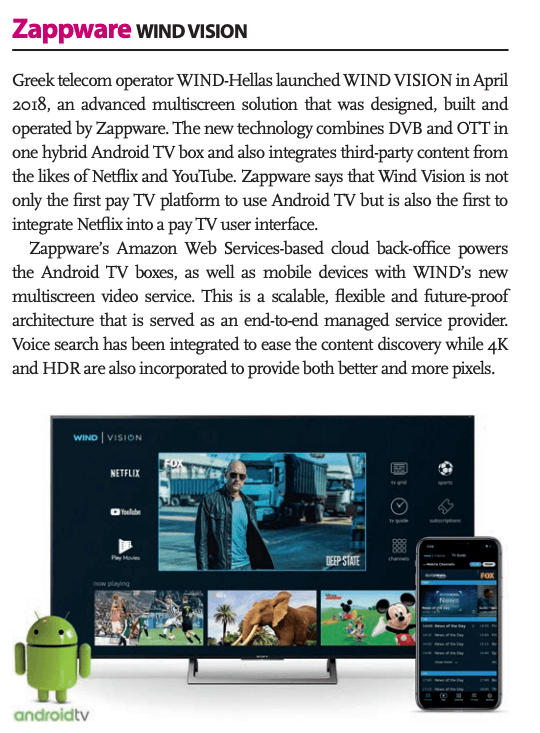 Zappware, founded in 2001, combines creativity and technology into powerful digital TV solutions for Entertainment Service Providers. Its proven and award-winning user interfaces currently serve millions of devices around the world and provide an intuitive and personalized multi-screen TV experience across set-top boxes, smartphones, tablets and PCs. It includes a unified Service Delivery back-office that allows the operator to monetize the service on cable, satellite, terrestrial, IPTV, OTT and hybrid networks.